Inspected all 15 miles of channels. Inspected and/or cleaned more than 1,000 feet of outfall pipes. 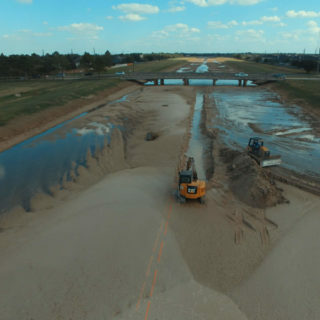 Removed approximately 180,000 cubic yards of silt from the District’s channel network. Removal of silt from the Diversion Channel downstream of Exploration Park. Repair of slope erosion in various channels across the District. Coordination with Fort Bend County Drainage District to remove silt within the main branch of Willow Fork in Buffalo Bayou that is the county’s maintenance responsibility. Develop a long-range plan for annual inspections, cleanout and repair of storm sewer lines. Coordinate with the United States Army Corps of Engineers (USACE) on Section 216 study of Addicks and Barker Reservoirs to ensure their design, construction, operation, and maintenance is as safe and effective as possible. Coordinate with the Fort Bend County and Harris County Flood Control Districts on efforts to update Drainage Criteria Manuals and Flood Insurance Rate Maps within WFDD.